Here's a list of our most frequently asked questions, we have tried to provide as much information as possible. How will I know my order has been accepted and is being processed? All orders placed on the Daniella Draper Jewellery website are confirmed with an email and if relevant, with a telephone call. If you haven't received an order confirmation email please get in touch with us at customerservice@danielladraper.com. All orders placed on the website are subject to acceptance and availability, we reserve the right to decline any order. Payment must be accepted and the billing address verified before we can dispatch any item. Please note that should your first order request a different delivery address to the card billing address, a delay may occur whist we confirm these details with you. Stamped or personalised orders cannot be cancelled or amended. If you need to amend any other items, please contact us to see if we can help with your request, this cannot be guaranteed. Unfortunately once an item has been marked as processing, we cannot cancel or amend the order. All items will be sent to you in a soft pouch and Daniella Draper branded gift box. Should you wish for a more eco-friendly packaging option please check the 'Add Eco-Packaging' box at the checkout, and help make your purchase kinder to the planet. Whilst we make every effort to ensure your item is presented to you at a high standard, we cannot be held responsible for the condition in which you receive the package. As all orders are made to order, we aim to dispatch between 3-5 working days from you placing order date. Should you need an item for a certain date or special occasion please contact us to discuss your requirements further. For U.K. deliveries we attempt to deliver within 7 working days, as all items are made to order this may be longer. For all other countries outside the UK we attempt a delivery date within 3 weeks from the order date. Should you need an item for a certain date please contact us to discuss your requirements further. We use the luxury delivery carrier DPD for all deliveries. All packages are covered by DPD insurance and will need to be signed for on receipt. You will receive your one hour window on the day of delivery once the driver has scanned all the parcels onto the van, this is usually by 12 noon. For all orders that are shipped outside the U.K. we complete the relevant customs declaration forms, however we cannot be held responsible for delays to delivery for items held up in customs. All services require a signature at their destination and are covered by DPD insurance. If your delivery has been delayed, please contact us and we will provide you with the tracking number to track your item with DPD. If an item is lost, or damaged the claim for compensation must be filed with DPD, unfortunately we cannot be held responsible for goods that are delayed or lost in transit. Here is the link where you can file a complaint, DPD complaints. My item was received damaged or faulty, what should I do? Whilst we make every effort to ensure your item is presented to you at a high standard, we cannot be held responsible for the condition in which you receive the package. If the items inside appear to be damaged or faulty please notify us within 48 hours of receiving your order. The claim with our carrier DPD must be logged within 14 days of the date of dispatch and a formal claim must be made within 28 days. Read more on how to submit a report to DPD for a damaged or incomplete parcel here. I wish to return my item or order, what should I do? Personalised, bespoke and stamped items cannot be returned. Earrings cannot be returned for hygiene reasons. 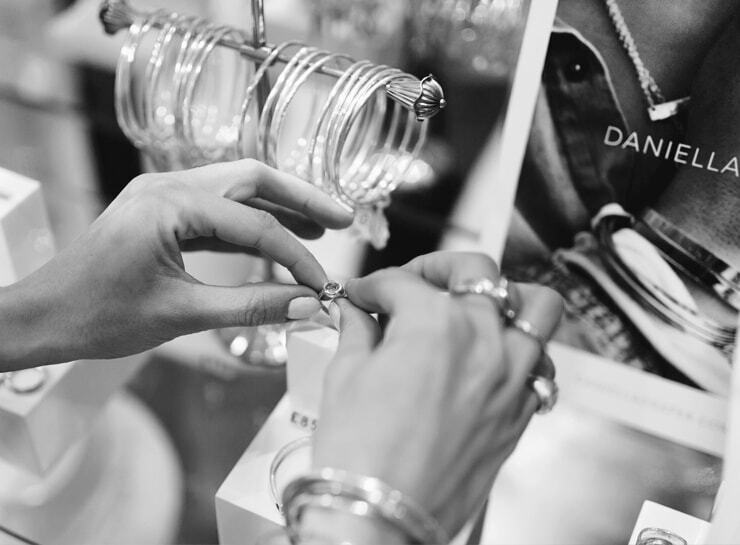 Daniella Draper Jewellery is made by hand, each piece is individual and therefore slight alterations from the images shown on the website may occur. If you wish to return an item for a refund, you must notify us via e-mail within 14 days of receipt of the parcel. Until the item reaches us, it remains the responsibility of the customer, we would recommend returning the item via a tracked delivery service as we cannot be held responsible for returns that are lost in the post. Items must be returned in a perfect condition, unworn and inside all the original packaging. Once we receive the item back with us, we shall process a refund within 7 working days, we do not refund return postage costs. We cannot be responsible for the time in which your bank may take to clear the monies. Your statutory rights are not affected. How should I care for and clean my jewellery? To ensure the longevity of your jewellery we would recommend not wearing whilst in the shower, bath or swimming. We would recommend to prevent mis-shaping, storing your jewellery carefully after wearing and avoiding banging, knocking or wearing your jewellery in bed. To clean your jewellery avoid silver dips and clean with a microfibre polishing cloth. Do not spray perfume or other solvents onto the jewellery. Should you want to know more information on how to care for your jewellery please contact us and we will be happy to advise further.